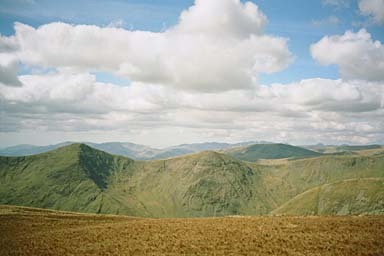 This is taken from about 400 yards south of the summit on the way to or from Kentmere Pike. Ill The shapely peaks of Ill Bell and Froswick are seen across the valley of Kentmere with Lingmell End protruding into the valley on the right. On the Horizon from the left are Caw, Coniston Old Man, (Ill Bell), Brim Fell, Swirl How, Great Carrs, Wrynose Pass, Pike o'Blisco, Crinkle Crags, Bowfell, Scafell, Scafell Pike, (Red Screes), Great End, Great Gable and Pillar.